We know, you’ve just made a New Years resolution to get fit and lose some weight and part of the plan was to eat out less, and here we come waltzing around throwing yummy food in your face. Terrible, shame on us. But it can’t be helped, not one bit. If you haven’t had pastes from Pastes Minería yet, you must, resolution be darned. What are pastes? Well, dear reader, pastes are wonderfully flaky pastry pockets with delicious innards (if done right), and Pastes Minería does them right. 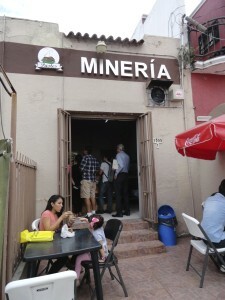 A chain with a few locations throughout Guadalajara, including Avenida Alfonso López Mateos in the Plaza del Sol area, Calle Morelos in Colonia Americana, and Avenida de las Américas near Avenida México in Colonia Ladrón de Guevarra, they serve up sweet and savory varieties, including pineapple, apple, Hawaiian style, and two types of mole. These treats are filling and great for breakfast, lunch, or as a snack, and they make for a quick bite to eat. Order and pay at the counter and get yours right away. Just be aware that they can get quite busy and lines are not uncommon during mealtime hours. The locations tend to have small seating areas (like the one pictured above in Calle Morelos) with a few tables, or, like most people, you can just get yours to go. Hours vary across the different locations. The one in Plaza del Sol appears to be open the most during the week, all seven days, from 8am-8pm, while the location in Avenida de las Américas appears to have the most restrictive schedule, 8am-8pm during the business week and 8am-2pm on Saturdays (closed Sundays). The Calle Morelos location looks to be open 8am-8pm during the business week and 8am-6pm on Saturdays (closed Sundays). We’ve seen these places close around 5pm or sooner, so we’re not sure if these hours mentioned here, taken from one of their signs, are the “real” hours. Economical to say the least, each paste goes for $15 MXN a pop at last check, just a little bit more than the average price of a single street taco, and they’ll go further in curbing your hunger. Show up in the morning or later in the day but make sure it’s well before they close as they often sell out of many varieties. Don’t say we didn’t warn you. After you have one (or three), you can go back to fulfilling that resolution. Until our next recommendation, of course.